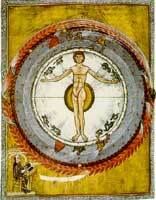 In 1998 I wrote and directed a music-theatre piece about Hildegard of Bingen, which was performed by the Scottish Early Music Consort in Glasgow and at the Stationers’ Hall in London for the St Ceciliatide Festival. Juliet Cadzow played Hildegard, Libby Crabtree, Fiona Milne and Colette Ruddy were the singers, Greg Squire, Kenneth Mitchell and Warwick Edwards played the instruments including a beautiful sinfonia made by John Hunter of Glasgow, and Warwick Edwards as musical director made a new performing edition of the music. We sought to bring a little of Hildegard’s extraordinary diversity of mind to today's audience, using her words, her music and her pictures. 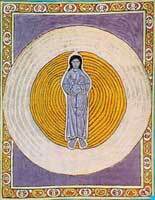 This programme celebrated the 800th anniversary of the birth of Hildegard of Bingen. From her small enclosed community on the banks of the river Rhine, she reaches out even today to an increasing audience. This extraordinary woman, revered by Popes and Emperors, was counted by the greatest theologians of her day as their equal. From her earliest youth she had visions, which she sought to understand on every level, and to express them in every way known to an artist - in words, in music, in pictures. And yet she was a very practical person, with an encyclopaedic knowledge of the healing qualities of plants and minerals, who founded and ruled two abbeys - a powerful woman in a man's world. The corpus of her work shows an astonishing mind, curious about everything in the creation and beyond, concerned to see and show the links between all things. The inspiring vision creates an overwhelming pressure to transmit the experience to others - and not only the vision, but the words spoken in the vision, and the song of the angels that is heard throughout. Hildegard is working on every level, expressing herself through her intellect, through the visual arts, through poetry, and through her music.